it may have been the two power ballads that i sang the evening we arrived at the resort. or the several interviews i gave to the local media the morning of our arrival in tacloban city. or the screaming for suggestions on how best to get the rope across the raging river. or the bird calls meant to determine whether we were on the right path, and that the person ahead of us was not too far away. or it may have been the lump that balled inside my throat as i watched in horror when one of my "kids" got swept by the current. or the rapturous laughter that pierced the air when one of us slipped and fell on our backsides. it could be any of these reasons. or none at all: it could be that i am just coming down with the flu. i am hoarse. my arms and legs are suffering from little red eruptions, and i have a few scrapes on my shin. i am a shade darker, and the doctor had just prescribed an expensive antibiotic and an awful-tasting expectorant, both of which i must endure for the next 7 days. and yet, i am energized, in more ways than i can imagine. i am possessed with more than the usual excitement. i am pulsing with life, and i begin to miss the company of the people i have spent five days with just when we are about to get together, because i know five days aren't forever. 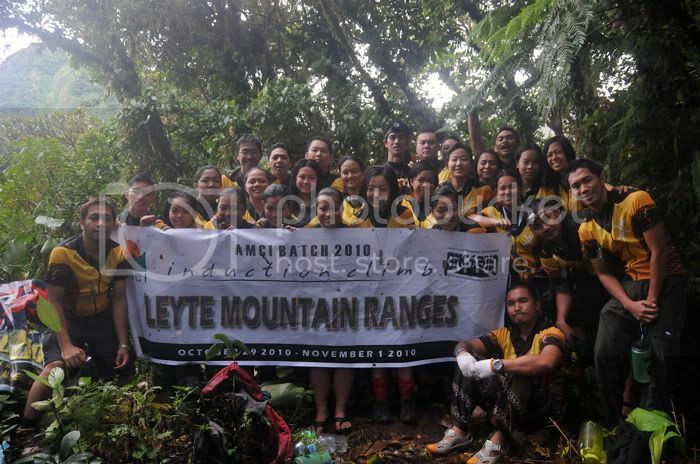 i was unceremoniously thrust to the dual role of assistant team leader and adviser in AMCI 2KX's induction climb at the leyte mountain ranges. shortly after our reconnaissance climb early in october, sir manny called me to lunch at buddy's in kalayaan avenue to inform me of the possibility that he would still be in australia during the dates we had specified for the IC. less than a week before the actual climb, after i've made most arrangements, both in manila and tacloban, the possibility had become a reality, and i was deluged with a string of events and circumstances, some less fortunate than others, providing additional wrinkles in an already heavily-creased tapestry. my group had worried they might lose me to the climb staff, and i comforted them by saying i was going to take on both responsibilities, which only later did i realize was not the wisest of things to do. i was unable to focus on my own group's preparations, having been concerned with the entire team's needs. my attention was admittedly divided, and i had to ensure that the team wouldn't have to worry about small details when we finally arrive in tacloban. late surprises are among my least favorite things, and i have an almost always biological reaction to them: they make me feel awful inside, and they tie my intestines into a tight knot. but the best laid plans have a way of going awry, and this climb had its share of last-minute twists. late in the afternoon of the day prior to our flight, our tacloban contact dennis called me to basically say that the whole of tacloban had run out of butane. a little after that, one of my own inductees informed me he had an ax over his head and ended up choosing work over the IC. i was more riled up about the latter and i fell into a deep pit of disappointment. i ended up not having a wink of sleep that night, and had to busy myself with more details to get my mind off the late changes. from my unit in makati, i went to NAIA-3 with janice, peig, sky, and TJ. we were all heavily burdened, and some groups had to cough up extra for having overweight baggage, but upon our arrival in tacloban city, i was soothed by the smooth turn of events. we had a nice free breakfast and an opportunity to shake hands with the vice-governor and were quickly on our way to burauen after saying rushed goodbyes to our friends who were to do their own leyte-rrific vacation. the jeepney ride to bgy. cansibuy was uneventful, if not utterly slow. a month earlier, my family jewels were under painful threat when 6 of us crammed onto 2 motorcycles on the way to bgy. mahagnao. this time around, we decided that it would be good exercise to trek on the unpaved road. 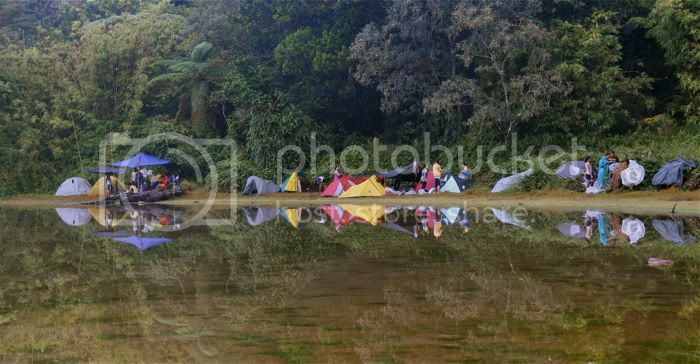 not to mention the fact that we had spotted a great camping site in one of the mahagnao volcano national park's lakes. it was an eerie, almost surreal site: the malagsum lake, which was the size of two UP sunken gardens, was nearly still, with only the gentle breeze causing ripples on its mirror-like surface which swallowed the surrounding trees and hills in an upside-down world. the locals had warned us not to walk into the lake, which is said to be either possessed or enchanted or both. but we were far too enthralled by its beauty to bother, and we were all giggly and alive as we turned the silent, swampy spot into a campsite. my group was dubbed a little too anti-social having chosen to camp at the far end of the lakeside where the ground was solid. 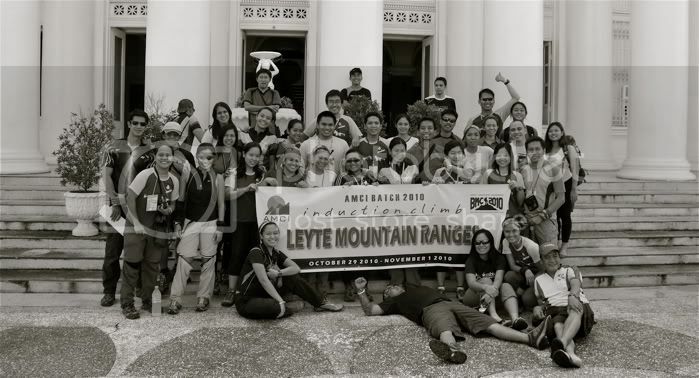 while the groups settled in, i hied off for the barangay proper to coordinate with our guides and some officials. when i got back to lake malagsum, i changed inside my debuting MSR hubba, and the moment i stepped out, i found niel with a grin that spanned the entire lake, announcing he had managed to get there after catching an afternoon flight and getting instructions from a woman who sat beside him on the bus to burauen. the evening fell slowly, and amid stories and revelations and a fantastic pasta dish i concocted, half a moon and a few stars looked over us and hinted that the grim weather forecast might after all not happen. i belong perhaps to the most garrulous group in the team: what mike, tin and owen lack for words, ail, martin, lans and myself more than make up for our seemingly natural gifts for gab. although we're all not on the same intellectual plane, none have any loss for words, regardless of the occasion. we had temporary relief from kurt's sudden absence by talking about him when ail could no longer blabber about ex-boyfriends and former crushes, or when martin was stumped by his inability to calculate what was the most efficient way to do certain things, or when lans paused from pulling some mundane and trivial thing from out of the blue. when our girls turned in, us boys walked over to the other campsite for a few more shots before retiring, and despite my drunkenness, i still managed to keep my vestibule open to keep me cool for the night. i woke up at a little past 3am feeling a cold breeze roll over my spine and i found the lake even more mysterious, draped by early morning light, still perfectly still and silent, calling me. i shut my vestibule and snored some more. when we woke up that morning, i was holding on to a firm promise of fair skies for the rest of the day. the guides appeared on the road, and we discovered we were missing one meal. nevertheless, we managed to pack up earlier than most groups and start the trek at precisely 8am. we passed the bigger lake, called danao, which is redundant since it means lake in the local dialect, and ended up in the barangay proper about an hour later. we gave the lead pack a head start while local men carrying abaca fibers the size of fishball carts over their heads arrived -- they all looked like sick rapunzels with their brittle-blonde hair bunched up over their backs. 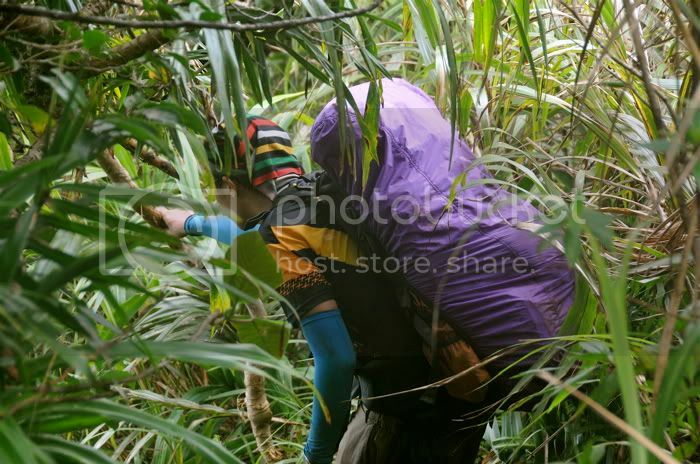 the trail from the barangay proper begins at an abaca plantation, then suddenly plummets nearly two hundred meters to the marabong river via the balentong trail, so-called because it is so steep, many have tumbled down the narrow path. i allowed my own group to go ahead while i waited for the sweepers, and chased them just as they were about to start the 11 river crossings. 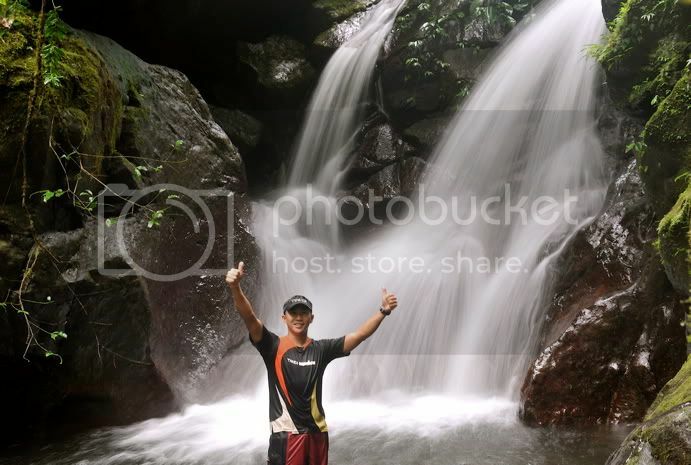 along the way, i heard weng chastise kuya mar, reminding him to trek as a group and "not as alone". at marabong, the river appeared the same way it did a month ago: clear, gentle and green. there were few banks astride it, mostly rocky, and the mountain rose steeply in parts that there appeared to be sheer walls draped with ferns and other plants. the sun winked above the canopy that clasped overhead, but this didn't last long. pretty soon, the sky turned ghoulish, and the weather turned sour. when we hit the pool of man, i was shocked to find it murky, even frothing. there was no use going in there for a dip. instead, we had lunch after a third crossing whence it began to rain, which turned our rice and food into rancid soups. we quickly picked up and rushed for the next few crossings: a fourth, a fifth, a sixth, and then a seventh: the longest, which required us to go against the current, at parts too deep some of us had to tiptoe, while others had to float on their packs. i hadn't spent a minute on the shallow portion of exposed rocks when TL dennis tasked me with looking for higher ground as it seemed the river was rising, so i crossed the eighth along with the two guides to drop my bag at an elevated area just beside a portion where the river tumbled over rapids and bent. when i went back to inform the team that there was much higher ground less than 130 meters away, we were surprised to find the river in the state it was in: steadily rising and a deeper brown, like coffee with milk and a dash of debris. in front of me, 4 girls were just about to cross, their hands held tight and i shouted that they remain still and move back. in a matter of 10 or so minutes, the river rose over two feet. the guides disappeared in the bush and sitting on a big rock, i watched as the river continued to rise, while my friends were just 60 meters across, on a mound of rocks. i was helpless in my position, and could offer neither help nor consolation. i just watched them there, as the river finally reached the soles of their shoes. it took me a bit more time to realize that they were diminishing in numbers. slowly, they dwindled, and i only noticed this finally when there were only about 6 of them, waving at me as i observed whether the river would rise to a level that would set off my own alarm bells. and finally, there was just one person left. apparently, they'd decided to climb up the steep wall to safety, and probably find an alternate route. i left my rock, sat beside my bag, and tried to talk to the young guide who couldn't speak a word of tagalog. then i began playing a game. in my mind i wondered: were they aware of a different way to bgy. kagbana that i wasn't informed of? what am i to do there, alone? i returned after nearly an hour to see if anything had changed: the river has subsided a little, although the current was still strong. 4 men were frantically trying to get the rope across the river, but were frustrated by lack of imagination. somehow, denz and already crossed, and neither martin, owen, nor clint could lasso a cow if it knelt in front of them, so it was getting a little comical. i went back to my spot and picked up a piece of bamboo. i figured that the weight of the anchor ought to be greater than the rope's, so we needed a more substantial object upon which to fasten the big rope, and the javelin throw seemed the most viable alternative. denz threw the pole to martin, who fumbled with it twice before clint managed to get it close enough for denz to jump at it. i anchored the rope onto myself, and then began the tedious process of getting all the climbers across the river. first was fars. she crossed without incident and i asked her to get my video camera. at this time, i tied the rope onto a piece of rock, and pushed it for added tension. next was tin. as she reached this narrow channel where the current was strongest and the river deepest, the rock onto which the rope was fastened at the other side moved, creating slack. tin slipped, pushed the rope down, and managed to get her entire body in front of the river's rage. she was pushed over the rope, and i whispered fuckfuckfuckfuckfuck as i watched her bob up and down while denz bound down to catch her. finally, she let go of the rope and i watched her roll over the rapids, tumble into the deeper part of the river, and methodically turn her body around to take her bag off and use it as a flotation device. all of us were planted still by our own shock. she maneuvered herself amid screams and shouts to the other bank and grabbed a root. she let go of her pack and let it drift downriver. denz chased her and helped her clamber up the wall, and i could only sense that they were still there when the leaves shook. this naturally caused our hearts to race faster, and i screamed for another man to cross and help me anchor the rope, so owen came in and provided much-needed muscle to get everyone across. 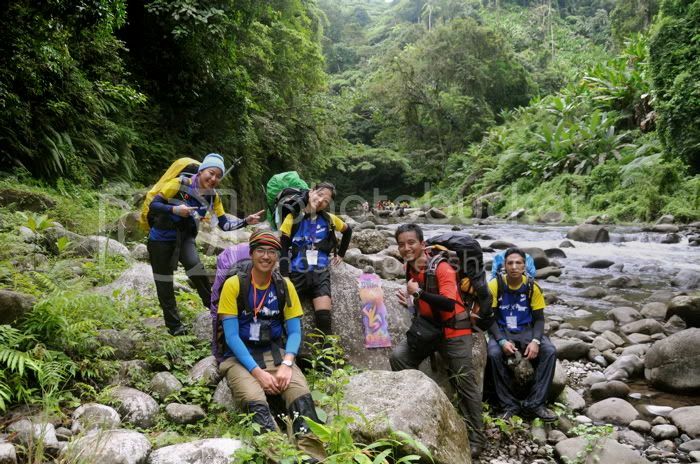 one by one the girls braved the river, their faces paled by the vicarious experience of being swept away, but smiling and laughing with tin as she wondered whether her bag got rescued. this took nearly all of 2 hours to finish, and by the time everyone had crossed, it was already well past 4pm. TL dennis appeared to deliver us good news. i was unaware that he had gone down and upriver to check on the well-being of the entire team. we had been sliced to 3 separate groups, each finding higher ground for safety, each with their own stories of survival and heroism to tell. dennis checked the condition of the last 2 remaining crossings while sky insisted that we do a bivouac. i waited for my TL to make the decision. it was already getting dark, and he recommended we stay put. he got his pack and went back to rejoin his group, two crossings away. he told me to start early the following day. only the day prior to our departure for tacloban were we informed that we would not have the benefit of a radio on the climb. but TL dennis's heroics and sacrifice made the radio seem unnecessary. he truly cared, and put his own safety at risk to ensure the entire team's welfare. so we found our spot not far away from the river, and realizing all of us just had trail water, my first order of business was to set up a tarp so i can collect rainwater to cook rice. i managed to gather two pots, and we ate martin's beef salpicao and had little to drink. no one was interested in opening our poisons, so i moved over to janice's group, which had created a palatial cube from several pieces of tarp -- they weren't interested in sleeping inside tents that night. we finished off a liter of my group's expensive vodka, and decided to call it a night at 10pm. i moved into my hubba and slept soundly, my thermarest having dried from the water that seeped inside during all those crossings. at 3:30am, i was up, barking orders. i immediately checked to see if the river had settled, and i was happy to find it clear, as though it had relaxed from the previous day's rage. we still managed breakfast consisting of corned beef and rice, and the sun was barely over the trees when i heard TL dennis's voice, rising over the droning rush of the river. the groups had gathered just before the ninth river crossing, some of them not having had time to eat breakfast, so we offered what we could. we quickly broke camp, and before long, after i said a prayer where i thanked God for everyone's safety as well as the opportunity to discover courage and strength within ourselves, we were fording the last 3 crossings of the marabong river, which temporarily swept over our lives with the force of thunder. 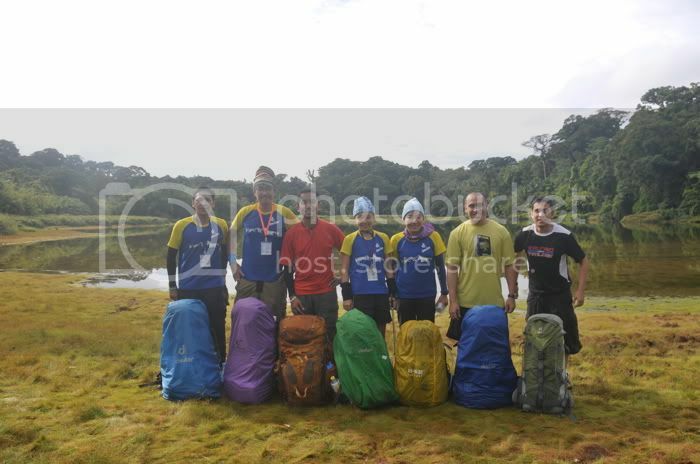 i turned into the bunga trail knowing that i was in good hands, that i had not compromised my safety and well-being by trusting in the sound and timely decisions made by my friends and fellow climbers. but more than that, it gave me the opportunity to realize something in me and in others to cherish for as long as memory serves me well. my sentimental ruminations were temporarily shaken when martin overshared. finally, we reached the 3 rivers junction campsite, and not far away, the barangay kagbana proper where we stopped to replenish our tired bodies. this barangay has no more than 50 households. the humble homes form a square around a school. while we were there, we deposited our donations with the school and handed out school envelopes with the most basic of school supplies to the kids. we hoped to have carried more, but there were only 48 climbers on this trek. the business of preparing breakfast and lunch was a spectacle for the locals. they watched us from windows and balconies with curious, but ultimately shy eyes. our head guide, sipin, offered us some kasili -- freshwater river eels -- which he boiled in salt and an aromatic leaf. my own group was struggling with our meal plan, discovering that the beef had spoiled a bit too early, so we improvised the kaldereta with the adobo meat. by 9:30am, some groups were already off for the sherwood campsite. i stayed behind while aldous's group struggled to prepare jason's complicated meal plan, and only left to run after my group. 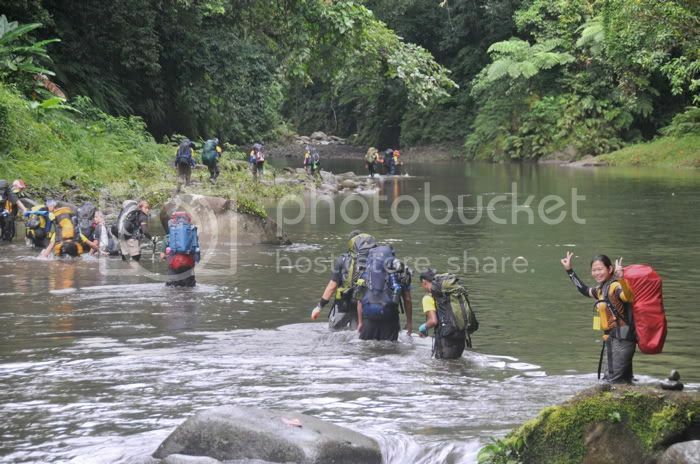 i reached them at troso ni dencio, running past the many tributaries of the karaganon river, and nearly losing breath going up through the abaca plantations. finally walking into leyte's forest, the environment turned nearly magical, with giant ferns and the slender fingers of palms stretching out over the earth, green swords of orchids hanging overhead, and the canopy bursting in song from unseen birds. 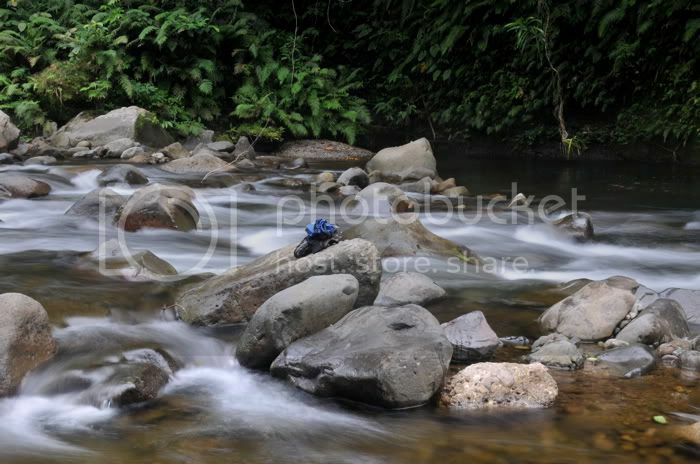 the eslagun river is a narrow stream of boulders, cool and caressing. we had lunch along its banks. also, ours was the only group that braved the icy rush of the eslagun falls. we went up the kasili catcher's trail and followed the route to sky's waterwall, which frequent rains had turned into a small waterfall itself. along the way, i observed that martin, out of exhaustion or loss of focus or both, fell on his backside rather frequently, so i told him to avoid stepping on smooth rocks. he replied by saying something like: it is possible not to slip on a frictionless surface if your forward motion is equal to your downward force. i humored him a little by engaging him in this long-drawn out exchange, asking him to explain his statement, despite my knowledge of physics being limited to what i may have picked up from watching 3 seasons of "big bang theory". he obliged my questions and demonstrated what it meant. he slipped yet again. i concluded by asking whether his theories helped him keep from falling and that i may not know jack about forward motion and all that, but still he slipped, i didn't. at this time, ail made a joke about the atom who was positive about missing an electron, and the neutron who treated everyone because it had no charge. finally, our travails for the day appeared to have come to an end when we reached the campsite. it had been cleared, but the rains continued, and the area was less than livable. nonetheless, i quickly set-up a kitchen tarp for temporary cover from the rains while my group spent time flattening the earth for their tents. 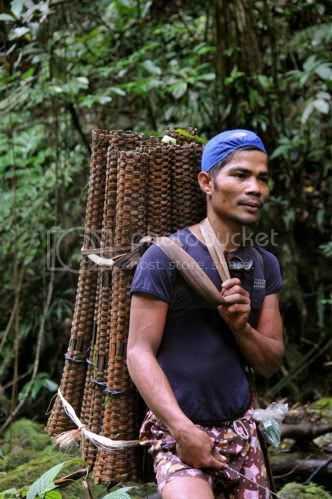 the last man arrived at a shade before sunset, although it was already considerably dark before 5pm: leyte's mountains are pure jungle, thick and savage. by 6pm, we already had dinner, an hour later, i was inside my tent, sleeping, not wanting to get my feet dirty, hoping the rain would stop. 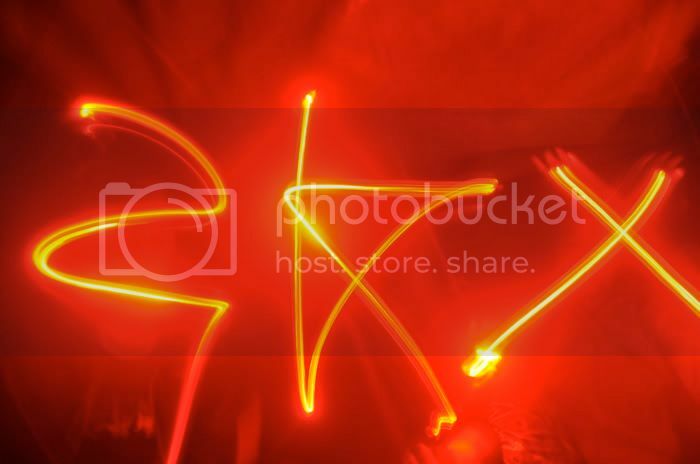 it was not until 4am the following day that i finally moved out to rouse people and order them to prepare for the induction rites. and then there is that part that will remain untold. at half past 5am, we had welcomed 29 new members into the club, all of them proudly wearing a pair of shiny dogtags over their necks, retreating into their kitchens, preparing breakfast and packed lunch. with everyone technically on equal footing, the gloves were off, and my group condescended on everyone else, with me at the helm, including those from whom we begged. TL dennis left with the lead pack and i conducted the last GL's meeting, warning them about risky ridges and dangerous descents. 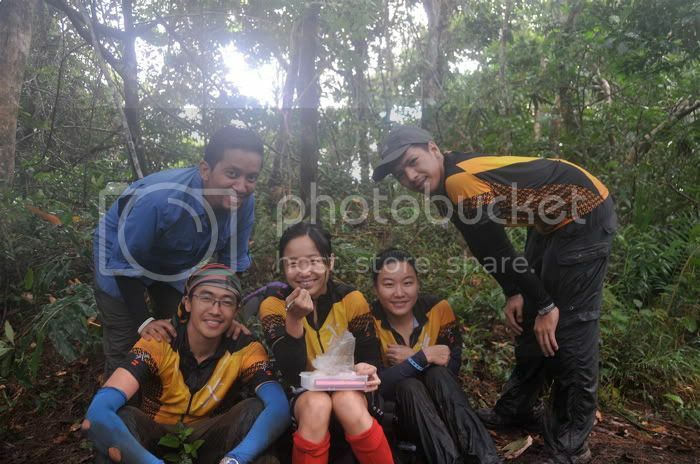 we were the third group to leave, and already, the trail had been badly beaten, and as a result, some of us walked out of that mountain, badly bruised. i had warned them very early on about a multitude of things that might sting or bite, so we very steadily trekked, aware that anytime we could be attacked. everything was going well until hambog ridge, where we were at least an hour and a half ahead of IT, despite having departed the campsite an hour behind. but due to the rains the previous days, the trail at the start of the karatong ridging trail -- one of the most perilous parts of the trek -- had become extremely difficult. even owen expressed surprise and bewilderment in trying to figure out how to deal with the terrain: parts of it were nearly impossible without ropes (and we had none), and there were areas where you could just plummet 20 feet down. but the delays were multiplied when we came upon TJ tumbling trail whose reputation soared in light of many other tumbles from several other people. by the time we reached the dinosaur's spine, a beautiful, narrow ridge beginning with a stack of cubic rocks, we were already behind the IT, and finally, the early sunset fell on us just before we reached the bukohan, shortly after wasps planted 4 stingers on my nape and briefly after kat (whom niel left behind) rolled down a 6-foot rock wall. by this time i was already upset because the night trek wasn't part of the plan, but i was energized to find TL dennis (who had already changed into clean clothes) along with 3 guides going back up the trail to meet us. later on, ail would say that this was TC2 done right, and i agree. we reached the hilapnitan river in baybay city where the language is already cebuano at past 6pm. we rinsed and waited for the sweepers to arrive. 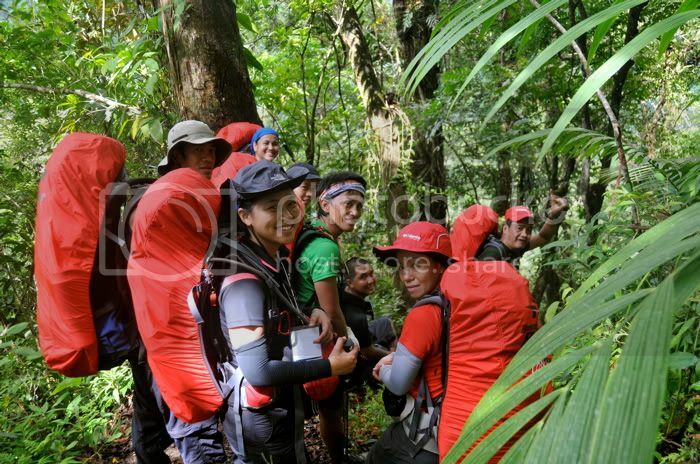 there were still about 15 people up there, and it provided me little comfort knowing that after buko-buko ng kabayo, the lead pack had ran out of trail signs and were ripping apart plastic bags to tie around branches and trees. nevertheless, i trusted the experience of my friends, and TJ's past knowledge of the trail to get them to where we were. 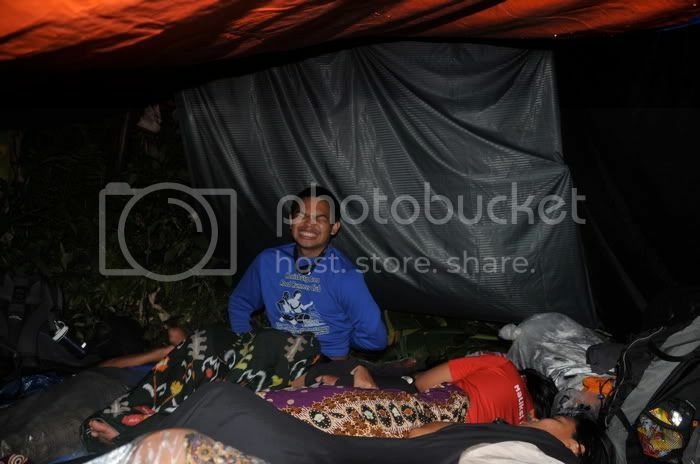 at precisely 8:23pm, while i sought cover under a hut used to dry copra, the last few faint lights beamed down the trail and i confirmed that everyone had survived leyte and its rivers, its ridges, as well as its surprises. we boarded the jeepneys and took the half-hour ride to sabin resort hotel and satiated our famished bodies with the buffet that had been waiting for us since 2 hours earlier. one would imagine that few of us would find the energy to continue through the night considering the ordeals we had just gone through, but when you've survived something of that magnitude unscathed save a few innocuous bites, you are possessed with life as though you've never lived before. suddenly, you are aware of things you take for granted: your beating heart, your pulsing veins, your breathing, your laughter, your friends' laughter. no other sound is sweeter than the sound you make, whether dumb or profound, because it is a sign that you celebrate your existence, and you seek to make it interesting. in the last 4 months of the BMC, many deep friendships were forged, and many of those who have reached this far may have noticed that their lives have been occupied by nothing but the training and the people they train with, eliciting jealous comments from friends who were not part of this shared experience. while we relish the return of our routines to normal, understand the pang that comes with this ending: here are gems of friends to treasure forever. not many are as fortunate to make such deep bonds in so confined a time. i feel i know more about these people than most people i've known ten times longer. i would trust many of them with my life, and i wouldn't mind drinking from the same cup as they do. because in four days through wet and wild, we all have grown together to become better women and men. so while this climb may not have enjoyed the usual support of more members, the members we had are all that we really needed. the stories of this climb will ring epic. glad to have been a part of it.